Indeed, using analytics tools may look intimidating, it requires experience, knowledge, and skill, which many people might not have. At the same time ignoring the data may become your competitive disadvantage since you may miss some important insights it can give you. So, we have created this guide to help job board owners start using Google Analytics, the most popular free analytics tool. In it, we’ll answer all your questions about Google Analytics, including what it is, what it does, key measures and reports, and how you can use them to enhance your job board. Google Analytics can look complicated to new users, but don’t worry — we’ll explain all the key areas and everything you need to know. You get a much better overall understanding of how your job board website is doing. You can make solid, data-driven decisions faster and easier. You can prove the success and viability of your business to stakeholders and investors. You will have powerful insight into the marketing channels that are bringing the majority of applicants or employers to your job board website. Google Analytics tracks visitors to your website. It tells you where they came from, how they use your website, their favorite pages, and all sorts of other useful information. It’s free, fast, and easy to setup, and gives you very powerful insight into the people using your job board website. 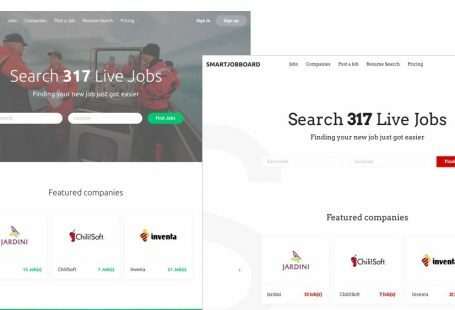 Learn how people are finding your job board content and website, so you can focus on improving those marketing channels, or starting new ones. For example, if you see you’re getting lots of visitors from Facebook, you can enhance your Facebook marketing. If you’re not seeing enough from search, you can enhance your SEO. Discover the most popular content on your job board website. If you find some very popular resources you can create more related content to give people a reason to stick around and use other parts of your website. Find out what pages are not working well for people and optimize them so they’re easy to navigate through and use. Optimize the “goals” on your job board website so you can make it as easy as possible for users to post or apply to jobs. Install Google Analytics by adding a unique “tracking code” to your job board website. Google Analytics uses that code snippet to track visitor behavior as they use your website. It then consolidates all this data into various reports you can use to analyze and understand important information about your audience. Sign in using existing Google account credentials. In case if you do not have an account, click on More Options > Create account. Enter your Google account’s username and password, and click the Sign In Button. The page you see is sign up for Google Analytics section, click on Sign Up. What would you like to track: website or app? Let’s choose Website. Choose your account name (probably your company name), and set up Property by filling in some basic information about your website. A pop-up window will appear. Read through and accept the Google Terms and Conditions, click on I Accept button. 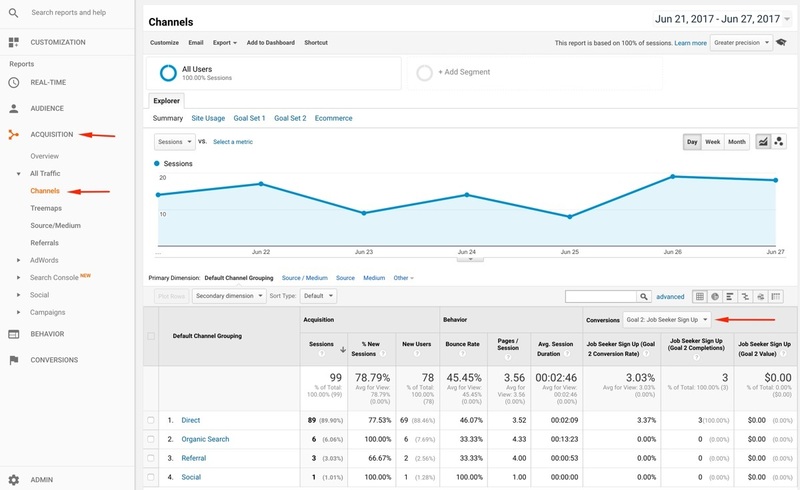 Google has created a simple guide to getting started with Google Analytics. Follow that, and you won’t go wrong! The majority of job board platforms include Google Analytics integration by default. If they don’t Google’s guide above tells you how to insert a Google Analytics code snippet. 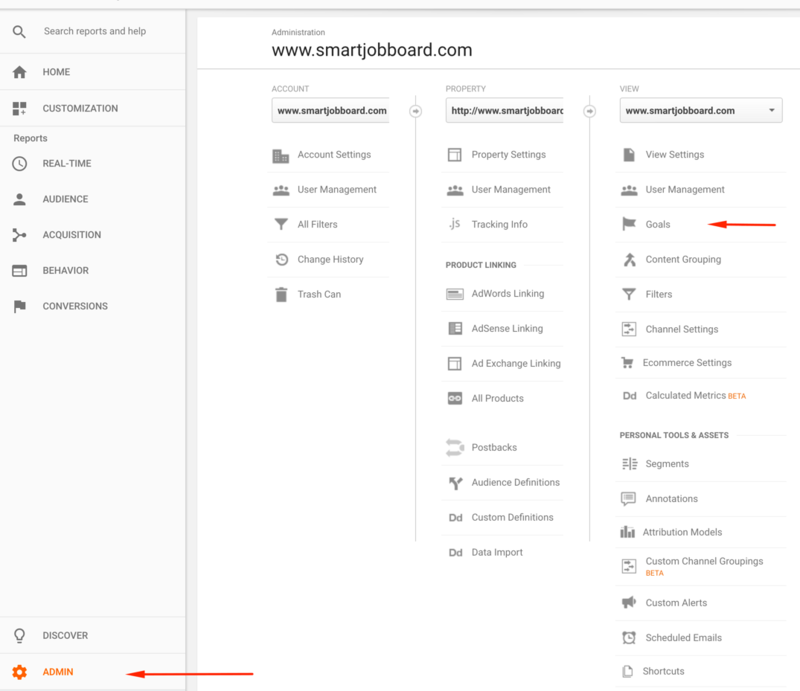 Smartjobboard has automatic Google Analytics integration by default. So no further actions are needed to be done once you connect your Google Analytics account to Smartjobboard. It’s vital to create a list of metrics to track before you strat to collect the data. That way you can make sure you’re focussing on improving the areas that will have the greatest benefit to your job board business. We’ll explain this in more detail below, but here’s a high-level view of the key measures we recommend tracking with Google Analytics. Number of website visitors so you can check how many people are coming to your website. Number of job views so you know that your job board website is meeting visitor needs. Number of applications so you can check people are applying to jobs. Number of job seeker sign ups so you know people want to register. Number of employers sign ups so you know employers want to post jobs. Number of jobs posted so you can check you can meet your revenue goals. 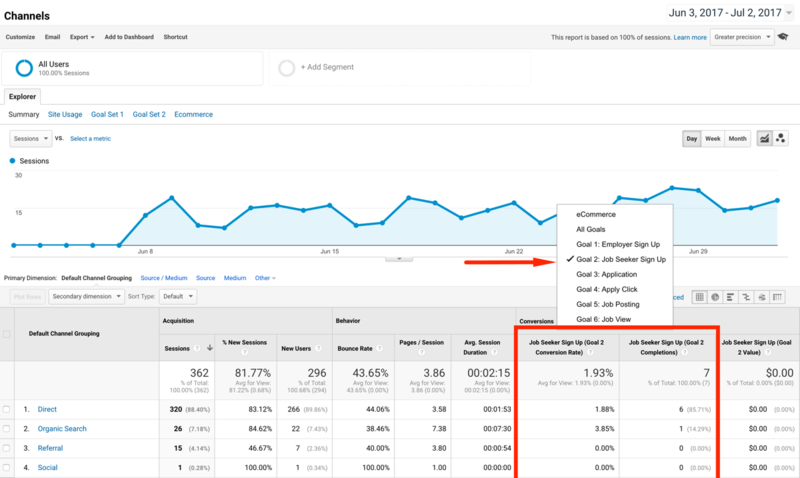 Google Analytics makes it easy to track each of these areas using something called “events” and “goals.” Just tracking site views by itself isn’t enough — you need insight into exactly how applicants and employers are using your website. That’s why it is vital to create a list of measurements you want to improve. When a person signs up to your newsletter. Posts a job to your job board website. Applies to a job on your job board website. Stays on your website for a certain period of time. Visits from a particular channel. 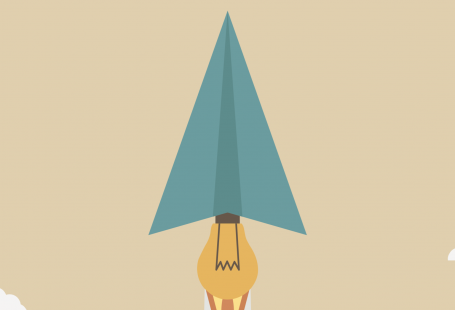 Essentially, if it involves someone doing something on your website, you can set a goal for it. This makes it much easier to track how effective your changes are. Google has an excellent guide all about setting up, tracking, and using goals. Typically, you track these goals when a visitor arrives on a certain page on your website. For example, when they have applied for a job, they might be taken to a “thank you for applying” page — those are the pages you track for your events. Here’s how to set that up. Go to Admin > Goals in Google Analytics. Enter the URL of the page the visitor will be directed to when they complete a desired action, e.g. /applicantthanks.html. Repeat this process for every goal you want to track. Smartjobboard creates GA goals automatically for you. So no further actions are needed to be done once you connect your Google Analytics account to Smartjobboard. Users — how many users your job board website gets on a daily basis. Sessions — the number of unique “sessions” people spend browsing your content — for example, if you have 100 users, and 120 sessions, 20 users may have visited twice. Page views — the total number of pages visitors accessed on your website. Pages / session — the average number of pages one visitor looked at in one session. Bounce rate — the percentage of people who just visited one page of your website and then left. Goals — the specific goals you set to track things like job postings, job board visits, recruiter signups, and more. Conversions — the number and percentage of sessions that resulted in a desired action being taken such as posting a job or applying to one. Here’s a quick summary of the key parts of Google Analytics. Each report lets you select the date period that you want to view data for. Reports generally show graphs and trend lines over time, so you can see historic and current performance. There are plenty of options so you can select the data you see in the reports. There are also detailed data tables that breaks down information further. The Audience section tells you everything you need to know about the people who visit your job board website including how many there are, where they come from, demographics, location, the devices they use, and other information. The Acquisition section tells you how people found and arrived at your job board website in the first place. It includes the channels they used, the source of the visit, Google AdWords PPC visits, organic search details, and social media. The Behavior section tells you how people interact with your website once they have arrived. It includes the pages they viewed, the content they consumed, unique page views, how they moved through your website, and more. The Conversion section is slightly different to the other sections, in that Google Analytics reports on what you tell it to. It bases these reports around “goals” that you set in the tool. Reports, goals, events, and conversions can help you identify potential issues with your job board website that you can then improve. Looking at your “Acquisition” and “Channel” reports can help you identify where you want to spend your marketing budget — SEO, social media, paid advertising, influencer marketing, blogging etc. 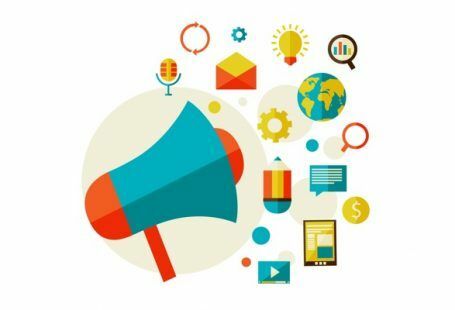 Effective marketing activities should lead to an upswing in visitor numbers and can help you understand your marketing return on investment (ROI). The channels where you see the most visitors and page views should be driven by your marketing strategy. See if you can link your marketing spend to an increase in engagement, visitors, and page views from those channels. Here’s how to use the “Acquisition” report to see the channels that are driving the most conversions to your website. At the bottom, you will see which channels are bringing you, visitors. If you have set up goals, you can see the channels that are causing people to perform specific actions. Choosing the relevant goal from the drop-down list shows you the direct relationship between the marketing channel you are using and the behavior your visitor is taking. Is your Facebook advertising causing more applicant signups? Are your LinkedIn promotions leading to more recruiters posting jobs? Does our SEO optimization strategy create more newsletter sign-ups? If there are a lot of site visits and only a few job views, this might mean something is wrong with how jobs are shown on your website or the traffic to your site is not relevant to the jobs that you have. If there are a lot of job views but not many applications there may be a problem with the “Apply” button on a job page, or job descriptions may be not relevant to job titles. If there are a lot of job views but not many job seeker sign-ups, you might need to make the “Sign Up” button more prominent on your site, or better explain to job seekers the benefits of signing up. Increase page and job views by creating more engaging, powerful content and using clear “calls to action” and links to other parts of your website. Excellent, intuitive navigation and menus can also go a long way to improving your page views. You want to make it as easy as possible for people to get around your website. Find your way around Analytics. Setting up Google Analytics on your website. Guides to using Google Analytics with Google AdWords. Phew! That’s all of the essential stuff covered. You can only enhance your business if you have the right data, so you can make informed decisions. Put Google Analytics into action, act on the results, and you’ll see big improvements in every aspect of your job board business. You just need to install Google Analytics, decide on the metrics you want to track, set up goals, and regularly review the information so you can improve things. Have you used Google Analytics to improve your job board website? If so, please let us know in the comments.